Excited? Need more information? Visit the website. Once again Laura Lowry-Greene is hosting a reception in honor of artists! On display will be works by the seven artists who donated their work for her Maple Uncommon sign. She has also planned for musical entertainment and always has wonderful food and drinks. 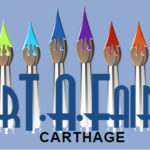 This is a great opportunity for JRAC members to socialize with their fellow artists. We don’t have that many opportunities to get together. So next Sunday, August 6th, between 1:00 and 3:00, stop by Maple Uncommon in Columbus, KS. and say “Hi”. This is a reminder about the JRAC Show and Reception at Maple Uncommon in Columbus, KS. on Sunday, June 25th from 1:00 – 3:00 in the afternoon. Just a very short 22 minute from Joplin. Since Laura Lowery-Greene has been so generous to us and has funded the past receptions, the board thought we could show our appreciation by helping out. Each board member has agreed to provide wine, snacks, appetizers and/or a dessert for the reception. Since we hope for a big crowd, we also hope other JRAC members would agree to help out as well. If you are attending and can bring something for the reception, please post back to us or contact a board member you know. We would really appreciate your help.